Capacitance capacity: 4 0.1uF/100V correction capacitors. PCB board: Using 1.6mm thick FR4 sheet, spray tin. The seat is a 7.62mm pitch. US location! Only one bare PCB board, not contain other parts and schematics. Thickness: 1.6mm, immersion gold process, beautiful and generous. Can be installed Capacitance size: 10 * 30mm (feet 10mm) Material: FR-4, double-sided immersion gold, 2 oz copper thick (70um) Compatible with two rectifier bridge size, wiring are metal, industrial-grade high-current interface, positive and negative power supply each have an LED indicator. Board size: 116.5 * 63.5mm. This product is assembled semi-finished rectifier filter board (not contain capacitance), 600V25A high-power rectifier bridge, dual AC input, positive and negative DC output, up to 70V dual AC input, current max 25A. Output voltage = input AC voltage*1.4. Mini LM317 power supply board, soft-start, adjustable output voltage. Also suitable for LM350, TL783, LM1084, LM1085, LT317 and other three-terminal adjustable voltage regulator chip. Wide range of input voltage, the rectifier can be bridge, full-wave, double-voltage rectifier and DC four ways (the actual use can only choose one, not compatible). It can also be used for LM350, LT317 and other three-terminal regulator block. Maximum operating current 1A (need to increase the heat sink or the LM317 mounted on the chassis), for the tube filament power supply is also very convenient. Reserved control port, can be used for lighting control and fan speed temperature control. Four pieces common cathode Schottky transistor composed of rectifier circuit, the equivalent of a rectifier bridge. 1pcs x Schottky Rectifier FilterBare PCB Board. Schottky tube is characterized by fast low internal resistance, class amplifier is very suitable. [Remarks]: 120A rectifier bridge stack can easily replace the ordinary rectifier bridge on the market. It is used on the power amplifier. It is a fever amplifier, and the mill is a very good choice. 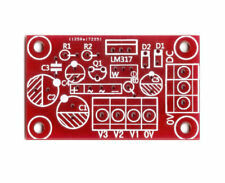 For TDA8920 LM3886 TDA7293 Amplifier. Dual Power Rectifier filter Board DIY Kits. 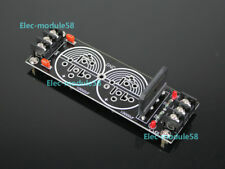 1pcs x Dual Power Rectifier filter Board DIY Kits. This is DIY Kits, Included all electric components as the main photo show, but it need you soldering its by yourself. Capacitance capacity: 4 0.1uF/100V correction capacitors. It is PCB bare board and doesn't have any parts. PCB board: Using 1.6mm thick FR4 sheet, spray tin. The seat is a 7.62mm pitch. Due to the difference between different monitors, the picture may not reflect the actual color of the item. It is PCB bare board and doesn't have any parts. Filter capacitor: 35V 4700uF / 35V 2200uF. 104 is 0.1uF capacitor with 25A flat bridge rectification. The seat is a 5.08mm pitch. Due to the difference between different monitors, the picture may not reflect the actual color of the item. 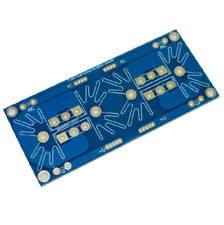 Amplifier Filter Board Power Board Blank PCB Universal Can fit 8 3.5cm diameter capacitors, multi-pin design, compatible with multiple capacitors Copper thickness 2oz, high-current design, with a tin wire Empty board, does not contain any components PCB size: 16.2*7.3 centimeters. You need to install 8 rectifier diodes and 4 filter capacitors (not included). (2) using the original 2510 rectifier. 5) 12A high current imported relay, the performance is more stable and more durable. The pursuit of first-class quality is our consistent purpose. Speaker protection function: delay DC protection. UPGRADED DESIGN! READ THIS BEFORE BUYING FROM OTHERS! Material: FR-4 Size: 73 x 73 mm (Length x Width) Thickness:1.6mm Surface finishing : double-sided solder resist for maximum durability. max 25A bridge rectifier/2PC Capacitors (30mm or 35mm Diameter) AC input connector wiring: AC: AC transformer connection line GND: Ground connection transformer Note: Single-voltage transformer connected only either one AC and GND, an AC remaining empty, still double the output voltage!. Tips: This item only one bare PCB board, not contain other parts and schematics. Thickness: 1.6mm, immersion gold process, beautiful and generous. Can be installed Capacitance size: 10 * 30mm (feet 10mm) Material: FR-4, double-sided immersion gold, 2 oz copper thick (70um) Compatible with two rectifier bridge size, wiring are metal, industrial-grade high-current interface, positive and negative power supply each have an LED indicator. Main filter capacitor using four ruby the capacity 10000uF/50V, output setting the high-frequency bypass capacitors, high-low frequency AC noise can be most filter net. 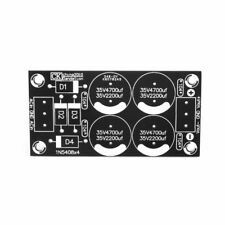 RC Rectifier Filter Board PCB Double Bridge Parallel PASS Power Board Special note: the product is a blank PCB without any other components Product parameters: 1. Up to two 3.5mm diameter capacitors can be installed. The rectifier bridge is a flat bridge such as KBPC1510 or 2510. 2. The terminal spacing is 5mm. The LED and small resistance are the indication functions. 3. There is a circuit board on the back of the PCB for reference. Size: 10*4.7CM. Product parameter: Max Input Voltage: Single AC 18V Board Size: 50mm x 25mm 8A bridge rectifier filter capacitor: For Genuine Ruby 3300UF / 25V (diameter 18mm, height 20mm, pin pitch 7.5mm) 0.1UF / 100V (pin pitch 5.0mm). Tips: This item only one bare PCB board, not contain other parts and schematics. Parameter reference: Capacitance capacity: 4 0.1uF/100V correction capacitors Rectifying flat bridge: using BR5010L. PCB board: Using 1.6mm thick FR4 sheet, spray tin. PCB size: 170*75mm Net weight: 40g (error within 5g). Fit on the capacitor specifications: 6 feet from the 10 MM; Maximum diameter 35.5MM; or 26 feet from 8 MM; maximum diameter 18MM. The seat is a 7.62mm pitch. 1PCS PCB Board. 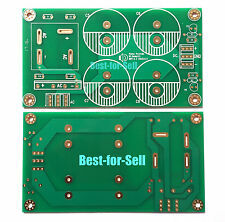 PCB board: 2mm thickness FR4 imported plate, copper foil thickness 2 oz. PCB size: 165 75mm. Dual Power Supply Bare PCB Board. Schottky Tube Rectifier Class A Power Amplifier Power Rectifier PCB Board Class A power amplifier power rectification fast recovery Schottky tube rectifier double group can be parallel output Suitable for common cathode rectifier You can do two sets of outputs or you can double the two sets of parallel loads. Size: 95*40*1.6MM Special note: delivery is just a PCB empty board, without any components.